The open-source uIP TCP/IP stack provides TCP/IP connectivity to tiny embedded 8-bit microcontrollers, with maintained interoperability and RFC standards compliance. 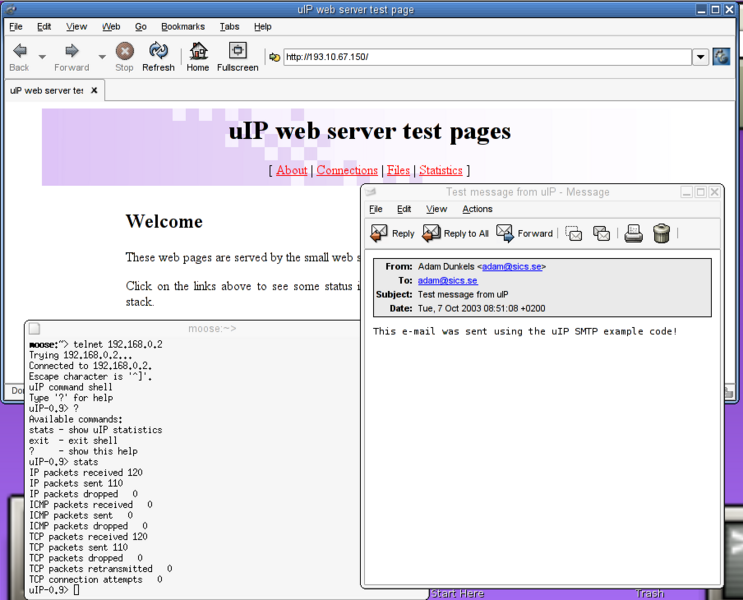 uIP was developed by Adam Dunkels of the Networked Embedded Systems group at the Swedish Institute of Computer Science but is further developed by a world-wide team of developers. Well documented and well commented source code – nearly every other code line is a comment. Very low RAM usage, configurable at compile time. ARP, SLIP, IP, UDP, ICMP (ping) and TCP protocols. Includes a set of example applications: web server, web client, e-mail sender (SMTP client), Telnet server, DNS hostname resolver. Any number of concurrently active TCP connections, maxium amount configurable at compile time. Any number of passively listening (server) TCP connections, maximum amount configurable at compile time. Free for both commercial and non-commercial use. RFC compliant TCP and IP protocol implementations, including flow control, fragment reassembly and retransmission time-out estimation.